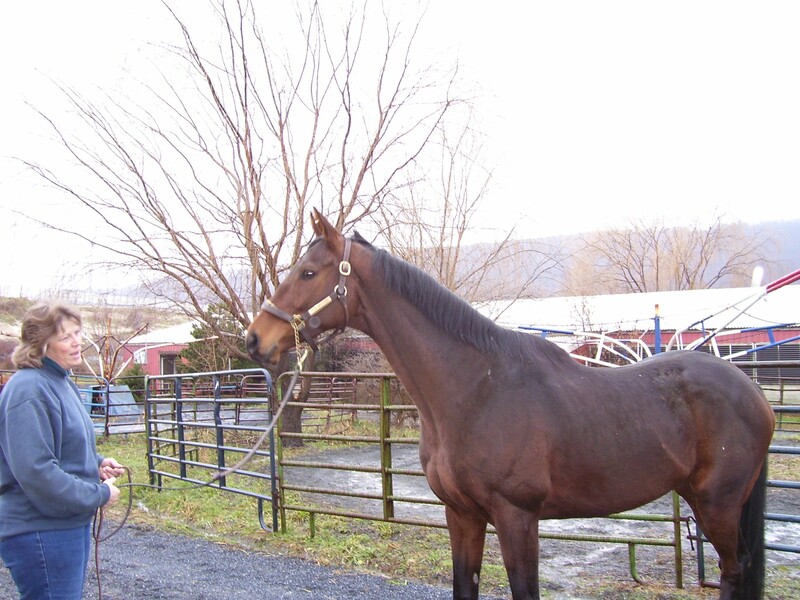 These are photos of the first day I met Thunder - on the backstretch of Penn National, December 28, 2005. I knew pretty quickly that he was my horse. 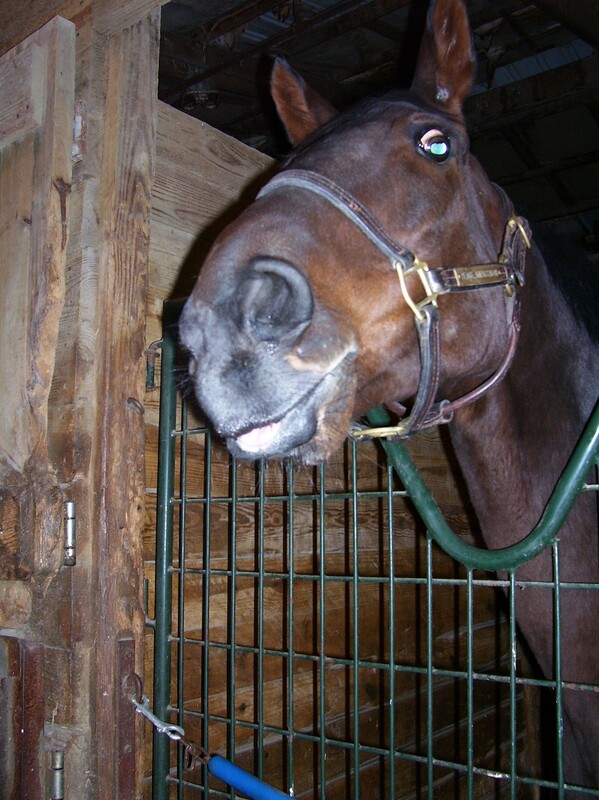 Thunder in his stall. Yes, he really is that big - 16.2 hands! As you can see from the photo, I was being checked out as much as I was checking him out. 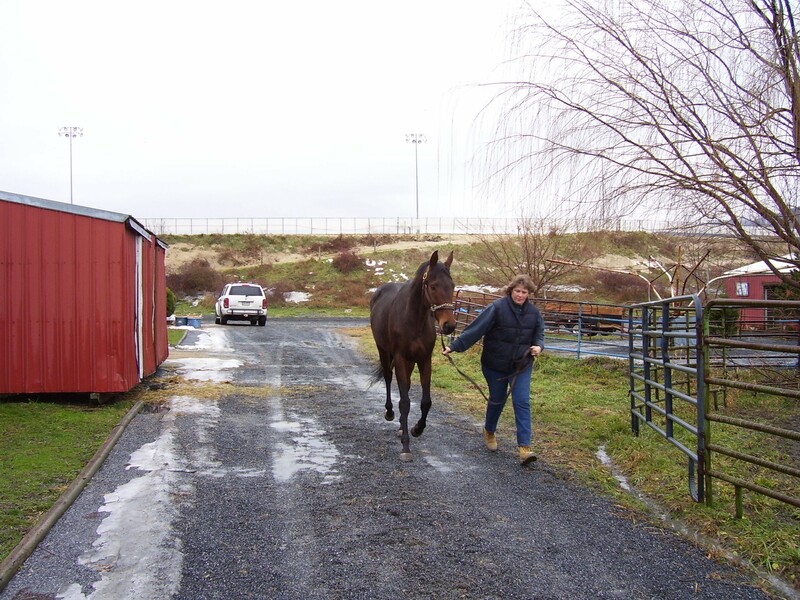 Thunder being trotted out by his trainer, Marcia Wolfe. Marcia has posted several horses on the CANTER website, she is very diligent in looking out for their welfare....and both Thunder and I owe her a debt of gratitude for it! Another of Thunder and Marcia. Thunder being vet-checked by the track vet at Penn National. This is a standard 'flexion' test to see if he has any soreness. He was very well-behaved through this process, which really impressed me (and he checked out fine). You can see from the photo that he's paying more attention to me with the camera than the vet. You can also see how thin he is...since there is no place to turn a horse out at the track, his feed needed to be reduced after he was through racing in order to keep him calm and without excess energy while he was confined in his stall without the regular workouts of a horse preparing to race. I'm working on putting some weight on him!